Thank you for taking time to look carefully at our school and learn more about us. We invite your questions, your visits, and your interest in experiencing all that Slade offers to our students and families. We work hard to live up to the invitation of the Archdiocese of Baltimore -- to go beyond the status quo and exceed expectations—to "Rise Above!" Welcome to a school where students consistently exceed expectations. Welcome to Monsignor Slade Catholic School! 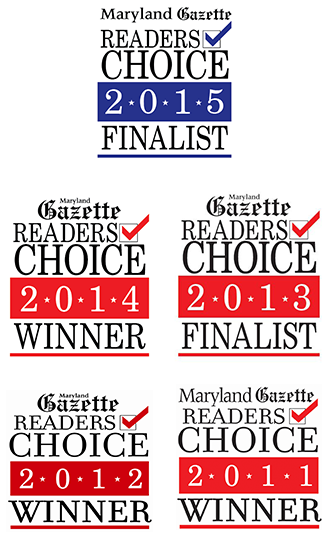 Monsignor Slade Catholic School is proud to have been voted a Winner or Finalist in the annual Gazette Reader’s Choice Awards for the past 5 years! Since 1954, we have been committed to providing the best possible K-8th grade education and PreSchool/child care in Anne Arundel County, and we will continue to honor our commitment in the years ahead. Thank you to our school families, our committed faculty and staff, our alumni, and to the greater Glen Burnie community for your dedicated support, year after year! We are very proud to announce that Monsignor Slade’s Home and School Association is one of five recipients of the 2011 Distinguished Home and School Association Award presented by the National Catholic Educational Association. The HASA is extremely active and works hard to raise money for the school and conduct community-building events. This well-deserved award was presented to our 2009-2010 HASA President, Mrs. Kristi Brooks, at the NCEA Convention in April of 2011. Read the full press release. Monsignor Slade has been named a ‘Top School’ for the state of Maryland in the 2009 Johns Hopkins University Center for Talented Youth Talent Search. Read more about Johns Hopkins University Top School Search. This special honor demonstrates that Monsignor Slade has a solid core of very high achieving students of whom we are proud. Monsignor Slade Catholic School school’s commitment to accreditation assures parents and the community that our school is focused on raising student achievement, providing a safe and enriching learning environment, and maintaining an efficient and effective operation. An accredited school adheres to high quality standards based on the latest research and successful professional practices. Monsignor Slade Catholic School is proud to be accredited by the Southern States Association of Colleges and Schools Council on Accreditation. Monsignor Slade Catholic School is an Archdiocesan Collaborative School (ACS), which is a model of shared governance developed by the Archdiocese of Baltimore. The ACS model utilizes a shared governance model that fosters unity through the collaboration of stakeholders in support of Catholic schools. The model allows decisions regarding day-to-day school operations to be made at the local level, while individual schools and school administrators are supported centrally from the Department of Catholic Schools and the Catholic Center's Central Services in areas such as academics, finance, development, enrollment management and marketing.